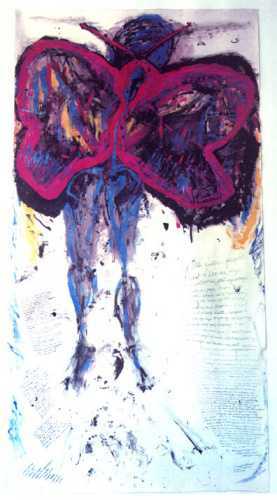 They Want to Collect Me," 1998, 145 x 45 in. my wings, and make me pay. and give my vital energy to someone more deserving. hopes and dreams -- my wants and desires. I have to run and make art to feel alive, to survive. his/her back and I was wrong. some become addicted to pain, sadness, inertia. the grass isn't necessarily greener. Carolyn Myss talks about "attitude of gratitude"
I try to be the best parts of my humanity. Whom do you want to be connected to? Whom do you really want to connect with? All artwork is copyright of the respective owner or artist.